Over the years, researchers have prepared a number of lists of sight words, the most famous probably being the Dolch sight word list. 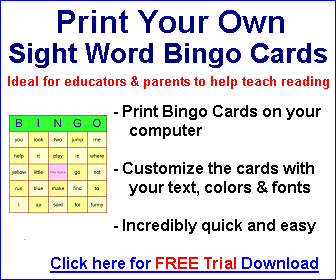 Instructions on how to create your own bingo materials of this type (for example, to produce more bingo cards or use different words) using the Bingo Card Printer software. Additionally, we provide a list of sight words education resources that you may find helpful.